She was great to work with, arrived on time and was flexible with all requests. Lastly, thank you for your kindness and thoughtfulness in getting to the event early. Over the years, I have coordinated many weddings and worked with hundreds of vendors …sadly enough it’s rare to find such kindness/positive people who truly love what they do. So I very much appreciated working with you and everything you did to make our event delightful. Just a quick note to thank you for your face painting efforts at the Blackhawk Plaza. I saw some of your work and it is beautiful. When I commented on the design to some of the children I could see how proud and happy they were with your designs. Just between you and me, I think you could charge a bit more for an appearance. I was sorry not be able to thank you in person but as in all these events, workers are pulled in many directions at once. Just a quick note to say thanks so much for making our party so enjoyable. We all loved the tattoos and painting decorations and the wonderful magic show that entertained us while we were enjoying dinner. Thanks also for bringing the bubbles – the youngsters had a great time with them! Wolfgang was a great hit with everyone too. Most of us brought our caricatures to work on Monday, so we scanned them and posted them on our office network – the people who were not able to attend were very envious! You and Wolfgang are very talented and we truly appreciate that you shared your talent and fun with all of us. Our party was a great success because of you. I am going to save your contact info and if we do it again, we will give you a call. Below is client feedback for GigMasters review. I’m already thinking about which upcoming events I’m going to book Carla for because she took our corporate party to a different level. She pulled a tough crowd of executives in from the very beginning and set the stage for a wonderful, light-hearted evening. Party-goers remained appreciative even after she left and commented on the novelty of having a ballon twisting magician open the night. Carla was extremely punctual and professional. She cares about her performance and takes time to plan the most appropriate performance. Bank of the West loves Carla! I wish I could express just how grateful I am in words, but I will do my best in referrals. You must think your performance so simple, but I’ve already had to circulate your website this morning as everyone wants to know how to book you. I am most happy to have exposed the team to REAL FUN! For several years I’ve been working with CW Entertainment to cover Grand Openings and other events for a National chain of pet stores. Not only have they always provided the very best in artists, but Carla has willingly and cheerfully worked with me to accommodate date changes and even developed a new variety of artists to fit the changing requirements of my company. Carla is an absolute delight to work with – always professional, with excellent communication and customer service that you don’t often see from businesses anymore. I cannot recommend CW Entertainment highly enough. 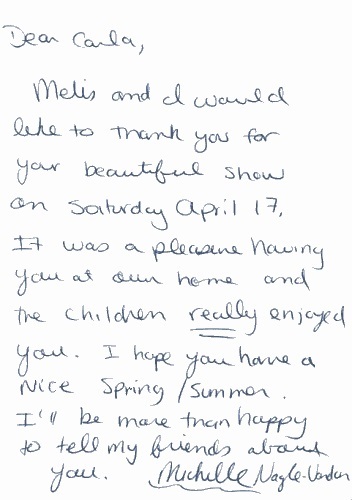 Carla — I’ve been meaning to e-mail you all day to say what a great job your entertainers did for us this past weekend. Santa arrived an hour early (didn’t want to be late! ), the carolers and their costumes were wonderful and it was great to see Katy and Dory again. I think the merchants were pleased. Thanks again. . .wishing you and yours a very Merry Christmas! Thank you so much for such a wonderful Saturday! My husband and I talked all weekend about what a joyous occasion it was. Please thank Santa, Katie and the fantastic carolers for me. I will miss you and Santa next weekend at River Oaks but I am looking forward to the event with the rest of your team! You are the best, Carla. This world needs more folks just like you!!!! Thank you so much for transforming me into a glitzy butterfly. You are very talented and did such a wonderful job. It turned out perfect, exactly how I imaged it. I think all of my friends will want to dress as butterflies next year! We’ll have to book you now. Take care and again, it was a pleasure meeting you. How I appreciate you! Thank you so much for coming to our employee party and doing face painting and balloons and just providing your sparkling personality. We are so appreciative of all you do for Sequoyah Country Club. Thank You Carla. Thank you so much for having Brett & me come to draw at the Women in Cable Telecommunications (WICT) dinner. The people were fun to work with and the atmosphere was pleasant. You always do a great job of taking care of your performers. I like the way you make us feel special. Wow! You were definitely a high-light of the party! Sam was so surprised :-). You really started the roast on a roll. It was fabulous-all on video too! Your talent is truly appreciated. Loved the song. You’re the Best!